As mentioned many times before (here, here, here, here, and here), I love Margarita Engle's writing. What a gift to learn about Cuba's history through novels in verse. The Poet Slave of Cuba is no exception; it tells the story of Juan Francisco Manzano. 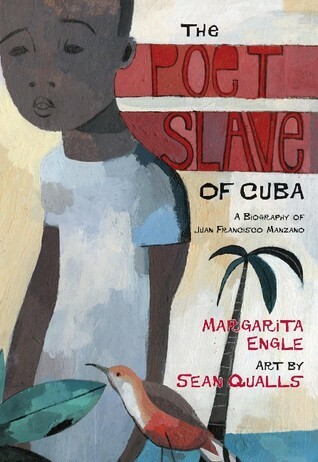 Juan was born a slave in Cuba and was treated as a pet by his master, whom he was made to call Mama. He learned to recite long pieces of literature and then did so at parties for applause. Meanwhile, his true parents watched and worried about their son. Juan was a gifted poet, and when he got a new master, he needed the beauty of poetry to help him through the torture she puts him through. The punishments that Juan receives are disturbing, which makes this book much darker than Engle's typical stories. While Juan finds solace in beautiful words, I think that middle grade readers would be upset to learn about his torture. Still, I am happy it is in my classroom library and hope that there are students who want to read it.